Those who don’t mind numb legs are the first to be exhilarated by an early season trout take. Sam Gould sounded the starter gun this evening with his first fish of the 2014 season spurring other Goulds within range to organize fly boxes, break out lucky Icelandic fishing sweaters, and to undertake the unpleasant ritual of making sure last year’s waders still fit. Thanks for the kickstart, Sam! 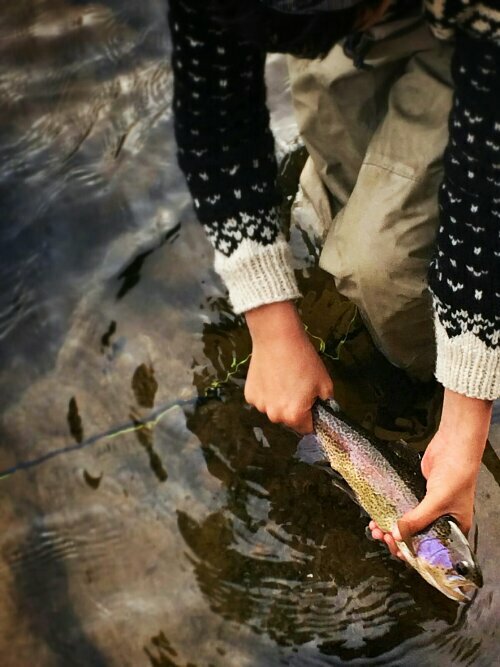 Pictured is his rainbow trout taken in a coldvriver on a woolly bugger. Photo credit: grandmother, grandfather, or fishing buddy? ← Trout Ponds open 4/26…time to thaw?